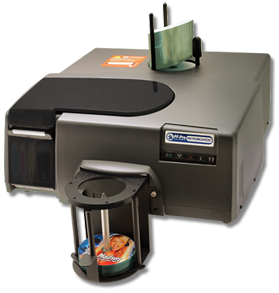 The Microboards Print Factory Pro inkjet CD / DVD printer is fully automated with a 100-disc capacity, large individual CMYK color ink cartridges, PC / MAC compatibility, and the ability to have up to 4 printers connected to the same PC. MSRP of $2995, and a street price around $2695. The Microboards PrintFactory Pro printer is more expensive compared with other inkjet printers like the Microboards PF-3 and GX Auto Printers, and the Primera Bravo Pro, Bravo II and SE models. There are multiple print resolution options with the Print Factory Pro. For our testing and production runs we used either the "text and graphics best" or "photo normal" options. The photo normal mode slower and lays down more ink, for a high-resolution print, than the text and graphics mode. The design of the disc artwork also influences the number of CDs / DVDs that can be printed per hour. We found that you get about 75 full coverage discs/hour printing using photo normal. With 30% print coverage using the text and graphics best mode you will get about 115 discs/hour. The Microboards PF-Pro has a bin capacity of 100 discs, either CD-r or DVD-r. This stacks up well against most other sub $3000 automated inkjet printers. A larger input capacity would be nice with the addition of the larger C, M, Y, and K ink cartridges. With inkjet printers the cost per print will fluctuate based on color combinations, print coverage, and the print resolution and speed selected in the Printfactory Pro print driver. We found that full coverage multiple color discs run about $0.12/disc. Discs with a 30% print coverage consisting of a few colors and black text cost about $0.05/disc in ink. Color graphics are vibrant, and the black text printing is pretty sharp. Models like the Microboards PF-3 printer are a bit crisper with text printing. The PF-Pro printer does a good job with large blocks of solid colors. Inkjet printers use water-based ink, so when the CD or DVD comes in contact with moisture, the print on the disc will smear and smudge. This is the case minutes, hours, days, and years after the disc is printed (unless you print on Taiyo Yuden waterproof discs). That being said, the Microboards Print Factory Pro is as durable as any other inkjet CD printer on the market. The PF-Pro has a single USB 2.0 connection to a PC or MAC. It comes with a popular and easy to use CD / DVD graphic software called SureThing. You can import standard graphic images like .jpeg, .bmp, .png and .gif. The print driver controls the robotic disc loading mechanism, so there is no complicated software to learn. You can also print directly from Adobe Illustrator and Photoshop with some adjustments to the margins within the printer driver. In addition, we were able to hook up 4 of the Microboards PF-Pro printers to a single XP Pro PC with a USB 2.0 hub. As with most inkjet CD / DVD printers, the Print Factory Pro needs to have the internal sensors, belts, and components cleaned about every 5000 discs due to ink over spray. In addition, there are two printheads (1 for Black/Yellow and 1 for the Cyan/Magenta) that need replacing every 50,000 discs or so. We have not had the need to replace any printheads as of this review. Microboards has above average phone technical support for the CD / DVD equipment industry. After warranty repairs can be expensive, as they are with other manufactures in this niche. Microboards PF-Pro (part# PFP-1000) is our top pick for automated inkjet CD printers for standard 120mm CD-r, DVD-r, and Blu-Ray media. Strengths include cost per print, speed, and the ability to hook up multiple printers on a single PC.